When I want a simple, yet filling dish to cook up for dinner, I often turn to fish. Throwing it on the pan with a side of vegetables is super easy, and with just a few added steps, you can make a dish that looks (and most importantly, tastes) restaurant worthy. Poaching sounds so daunting, but here you will see it’s actually super easy! It is also a very healthy and delicious way to cook fish since it requires no oil and instead uses indirect heat which results in tender, moist (sorry for any of you who hate that word) fish. 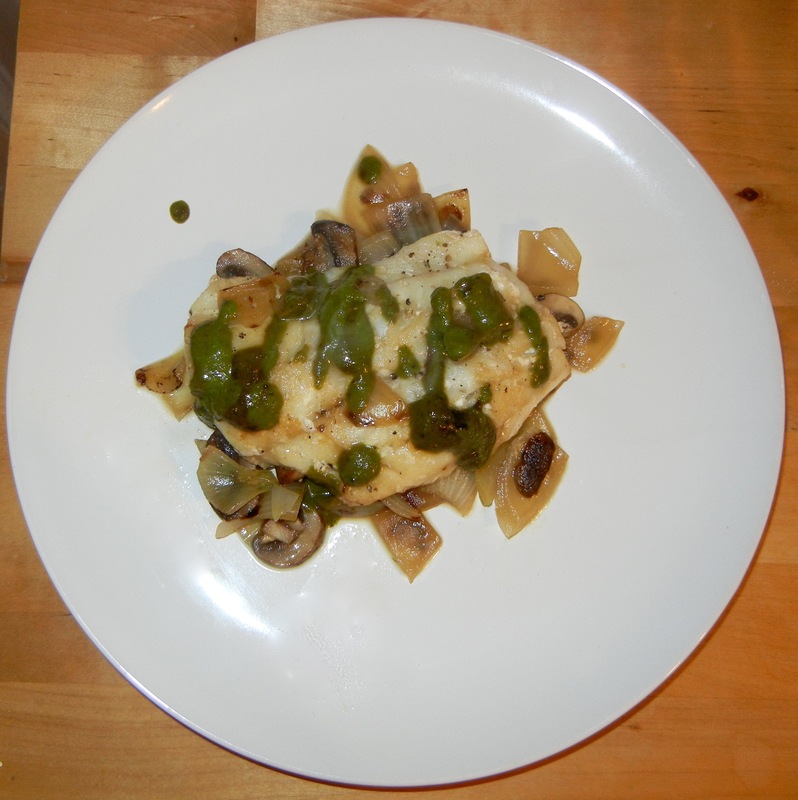 Here I sauteed vegetables to serve as the base for my fish and served the poached fish on top, drizzled with a pesto sauce. Make sure to use a low sodium broth in this recipe though because otherwise the sauce gets super salty when combines with already salty pesto. I recommend using Pacific/ Atlantic line or pot-caught Pacific cod as it is an ocean-friendly seafood choice due to the fact that its populations are well-managed and the fishing gear used is environmentally friendly. Heat oil in a large skillet over medium-high heat. Add the mushrooms and onions into the pan and stir occasionally for about 2 minutes until onions soften. Sprinkle both sides of cod with salt and pepper. 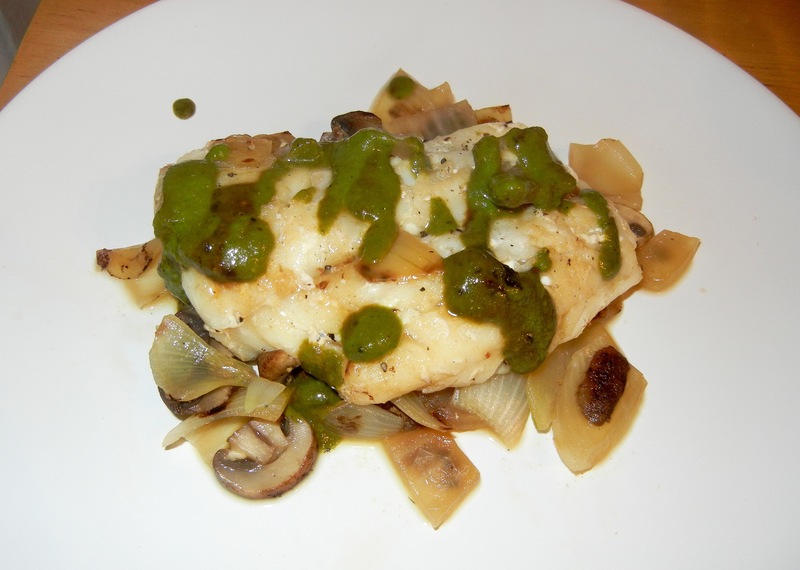 Place mushrooms and onions to create an even later in the pan and place the cod on top. Bump up the heat to high and pour in the broth. Next, cover the pan and cooked for 4-6 more minutes until cod is just cooked through. 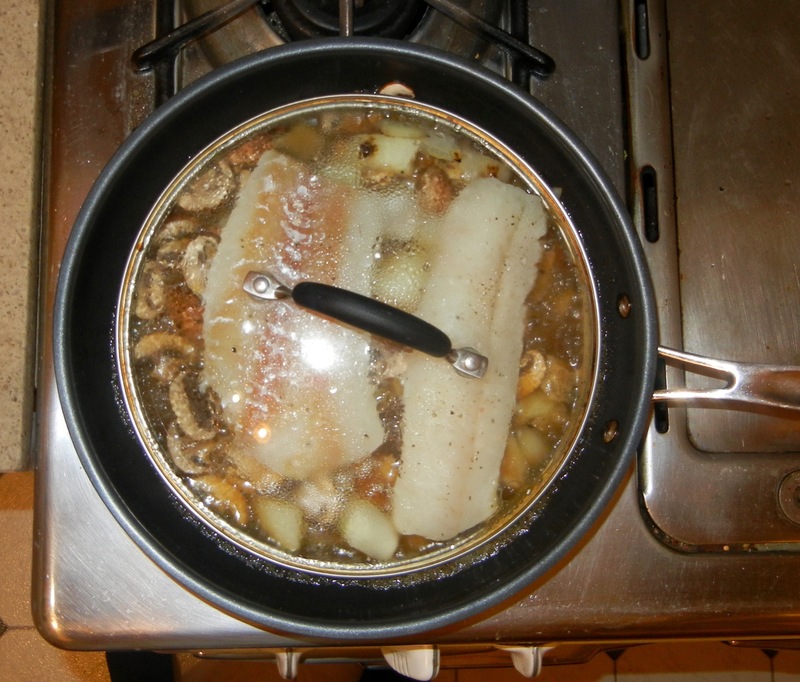 With a slotted spoon, transfer the cod and mushrooms and onions to a large serving plate and cover to keep warm. Continue to cook the broth over high heat, uncovered for about 5 minutes, until reduced to about ¼ cup. Once reduced, turn off heat and add in the pesto. Pour this finished sauce over your fish and vegetables.